Bike Trial Xtreme Forest is an amazing bike simulation game with awesome graphics and fun cross bike gameplay. You must jump onto your cross bike and drive along a forest trail. The trail, of course, has many obstacles and humps to overcome. Everywhere, there are trees, wood, bridges. But on the other hand, it’s a wonderful place to do tricks, flips, turns forward and backward. As you race you can pull off awesome tricks such as a back flip and a front flip. In Bike Trial Xtreme Forest: The physics and bike controls are easy to master but you must have quick reactions and great riding skills. The game is not easy but in the settings you can set the acceleration and the game will be easier. The game has several levels. A great motorcycle ride simulation is waiting for you. Can you pass through the game to the end? 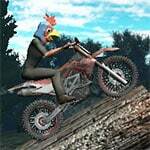 Bike Trial Xtreme Forest Game is one of our Driving Games at Round Games. It is also tagged as a bike and skill game. To play even more free games, view our most played and all games pages. If you want to play more games like Bike Trial Xtreme Forest Game: Then you can simply check out the games inside the game tags that are the most relevant to your interests or check the Driving Games category or check the related games section at the end of the game page. W or up arrow to accelerate. S or down arrow to move backward. AD or left/right arrow to tilt.